Photographer Chad Blakley snapped this view of the northern lights over Abisko National Park in northern Sweden. 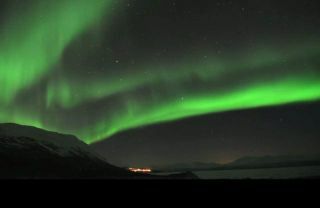 The photo is a still from a video Blakley created called "Lights Over Lapland." An incredible time-lapse video three years in the making has captured the bewitching northern lights over Sweden, as seen by a talented aurora photographer who stitched the eye-popping scenes together from thousands of individual images. Photographer Chad Blakley spent thousands of hours over the course of three winters capturing stunning views of the northern lights from Abisko National Park in the Swedish province of Lapland, which is located approximately 121 miles (195 kilometers) north of the Arctic Circle. "By my calculation I have spent no less than 2,000 hours pointing my camera at the sky recording the northern lights to create this film," Blakley told SPACE.com in an email. The nearly 14-minute time-lapse video, called Lights Over Lapland, showcases hauntingly beautiful auroras, with green, magenta, blue and purple ribbon-like hues unfurling across the night sky. "The video was created using DSLR cameras and a time-lapse technique that required thousands of images and hundreds of hours to produce," Blakley wrote in a description of the piece. "The opportunity to spend so much time in such an incredible environment capturing this phenomenon has been one of the most amazing experiences of my life." Blakley used special time-lapse photography techniques to create the video. "Depending on the length of the film I usually shoot anywhere from 400 to 2,000 images over the course of the night and then compress them into a useable sequence," he said. "I feel extremely lucky to live in a place that allows me to see the auroras so often." Auroras are some of the most impressive night sky experiences on the planet, and the phenomenon has inspired countless photographers and videographers — on the ground and in space. The ethereal northern and southern lights are caused by solar particles interacting with Earth's upper atmosphere. The northern lights, or aurora borealis, are typically visible in high latitude regions in and near the Arctic, while the southern lights, or aurora australis, can be seen from the opposite pole. SPACE.com video producer Steve Spaleta contributed to this report. Follow Denise Chow on Twitter @denisechow or SPACE.com @Spacedotcom. We're also on Facebook and Google+.